Begemder (also Gondar or Gonder after its 20th century capital) was a province in the northwestern part of Ethiopia. There are several proposed etymologies for the name Begemder. One is that it came from Bega (Beja) plus meder (land) (meaning land of the Bega or Beja), as an inscription of Emperor Ezana of Aksum describes his movement of 4,400 conquered Beja to a not yet located province named Matlia. 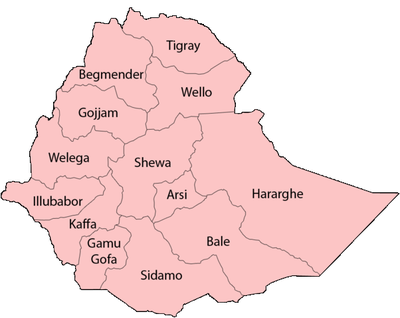 A perhaps more plausible source for the name "Bega" is the self-name of the Gumuz living in Metekkel Zone of the present-day Benishangul-Gumuz Region up through Qwara wereda of the North Gonder Zone of the Amhara Region. In Gumuz, /ɓaga/ means 'people' and this is how they refer to themselves (in areas north of the Blue Nile). Thus, "Begemder" likely refers to 'land of the Gumuz' just as "Agaumeder" (an adjacent area) refers to 'land of the Agau'. Another etymology is that the first two syllables come from the Ge'ez baggi` for sheep (Amharic beg), although Beke claimed that sheep have never been pastured there, nor could they be raised there. Beckingham and Huntingford note that Begemder originally applied to the country east of Lake Tana, where water is scarce, and conclude, "The allusion to lack of water suggests Amharic baga, "dry season", as a possible source of the name." The earliest recorded mention of Begemder was on the Fra Mauro map, (c.1460), where it is described as a kingdom. While Emperor Lebna Dengel, in his letter to the King of Portugal (1526), also described Begemder as a kingdom, he included it as a subdivision of his empire. During the later 18th century, its capital was at Filakit Gereger, where Ras Ali died in 1788. Begemder's boundaries were revised as a result of Proclamation 1943/1, which created 12 taklai ghizats from the existing 42 provinces of varying sizes. A comparison of the two maps in Margary Perham's The Government of Ethiopia shows that Semien and Wolqayt provinces were added to Begemder. With the adoption of the new constitution in 1995, Begemder was divided between two new ethnic regions (or kilil): Wolqayt province became part of the Mi'irabawi Zone and Tselemti district became part of the Semien Mi'irabawi Zone, both in the Tigray Region, while the remainder became the Semien and Debub Gondar Zones of the Amhara Region. ↑ Munro-Hay, Stuart. Aksum: An African Civilization of Late Antiquity (Edinburgh: University Press, 1991), pp. 48. ↑ Ahland, Colleen (2012). A grammar of Northern and Southern Gumuz. Eugene, Oregon: PhD Dissertation, University of Oregon. p. 10. ↑ Bereket Habte Selassie, "Constitutional Development in Ethiopia", Journal of African Law, 10 (1966), p. 79.